Would you like a chance to pick the brains of the people who run Aetna, Cadbury Schweppes, Coca-Cola, Starbucks, Dell and dozens of other companies? 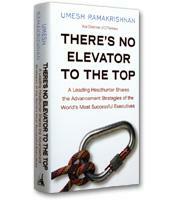 You probably can’t get this type of access to leading C-suite executives, but author Umesh Ramakrishnan can, and here he shares the executives’ strategies and insights on what distinguishes the businesspeople who climb to the highest. Most business school grads have one thing in common: They all want to be the wunderkind who goes from an entry-level job straight to the executive suite. That sort of meteoric rise sounds idyllic. But a zigzag to the top may be the more successful approach, according to Umesh Ramarkrishnan, author of There’s No Elevator to the Top: A Leading Headhunter Shares the Advancement Strategies of the World’s Most Successful Executives. Ramarkrishnan, a long-time executive recruiter, interviewed dozens of C-level executives and asked them for their strategies for success. Based on those discussions, Ramarkrishnan argues that people who embrace the more mundane steps –– the routine tasks, standard performance reviews and team-building exercises –– are better equipped to lead today’s corporations. By taking the road less traveled, these future executives got a taste of how the company worked on an intimate level. They networked with people. They got exposure to the kinds of experiences that a CEO needs to lead an organization. This is just one example of the advice that came out of Ramarkishnan’s work. Over the course of his research, he questioned leaders past and present. He focused on large, well-known companies including Aetna, Coca-Cola, Charles Schwab, Starbucks, Dell and Fidelity. The execs he talks with gave frank, even brutal answers. They gave a lifetime’s worth of perspective on their jobs, relationships and more. More important, they touched on the key moments in their development. Ramarkrishnan’s enthusiasm for his work may be the reason so many executives opened up to him. He is vice chairman of the global executive search firm CTPartners, where he recruits CEOs, CFOs, directors and other senior management for some of the world’s largest companies. It’s given him plenty of frontline experience. His eye for a great story is keen. For example, Ramarkrishnan relates a tale from Jim Donald, former CEO of Starbucks. Donald had worked with Sam Walton, founder of Wal-Mart discount stores. Walton made a point of meeting with every level of employee in his organization; he even went so far as to make himself look clumsy so they would feel more comfortable talking to him. “Never be bigger than the front line,” Walton said, in Donald’s recollection. There’s No Elevator to the Top is laden with anecdotes and descriptions of situations when executives resolved problems and learned key life lessons, which makes it an essential read. However one of the book’s downfalls is that the writing style never varies from chapter to chapter, so it can start to feel like the reader is going over the same material. Ramarkrishnan makes every chapter useful, especially thanks to bolded “Executive Summary” bullet points at the end of each section which give readers a quick way to review the most important information. But what ultimately makes Ramarkrishnan’s book worth reading is its multiple approaches to everyday issues. He uses the experiences of executives to break down topics ranging from work-life balance to diversity to risk-taking. It would take the average person thousands of hours to hone this information for themselves. Instead, Ramarkrishnan has done the work for us.